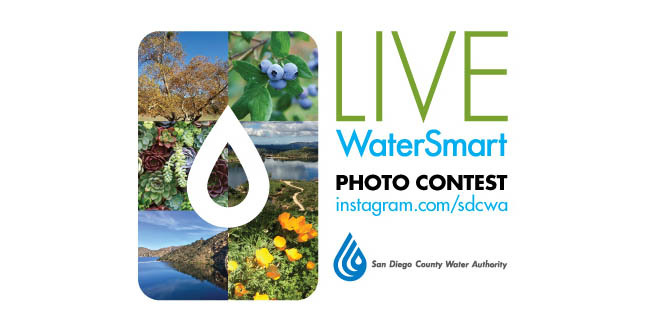 In celebration of Water Awareness Month in May, the San Diego County Water Authority is launching the Live WaterSmart photo contest to highlight the value of water and promote water-use efficiency as a lifestyle regardless of the weather. The Water Authority will host the photo contest on its Instagram page @sdcwa from May 1 to May 31. The final deadline to submit contest photos is by 5 p.m. on May 31. To participate, take a photo that demonstrates how water is an essential part of your life – indoors or outdoors – and submit it to sdcwa@sdcwa.org. Photos that meet contest rules will be featured on the Water Authority’s Instagram page beginning May 1. The Water Authority will award grand prizes to the two participants with the most photo “likes.” The first place grand prize winner will be awarded with a one-night stay for two at the Hilton La Jolla Torrey Pines. The second place grand prize winner will receive four tickets to SeaWorld San Diego. The Water Authority will also select two runners up based on originality, composition, and how well the photo connects to the theme. Thanks to the Balboa Park Cultural Partnership, one runner up will receive a four-pack of Explorer One-Day Passes to visit up to five museums in Balboa Park. The second runner up will receive three gift certificates to The Cravory. Each of the winners and runners up will also receive four tickets to the 2017 San Diego County Fair. For more information on contest rules, sponsors, and prizes, go to sdcwa.org/live-watersmart-photo-contest.